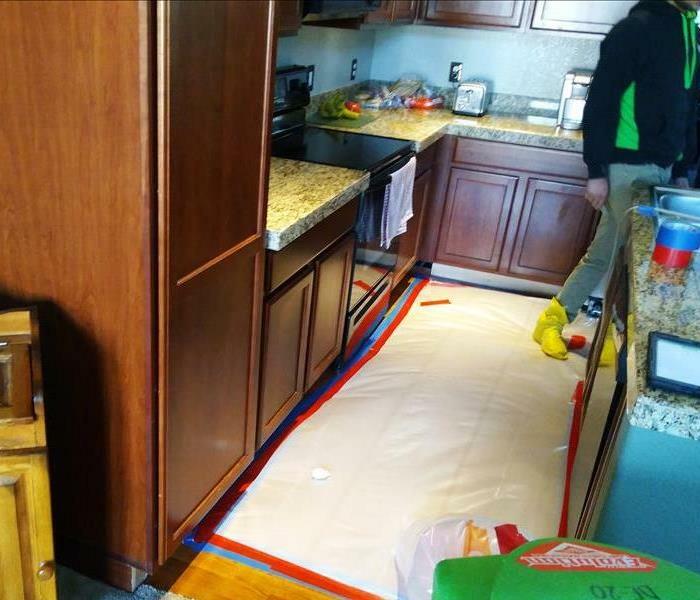 Our SERVPRO Heroes make it "Like it never even happened." 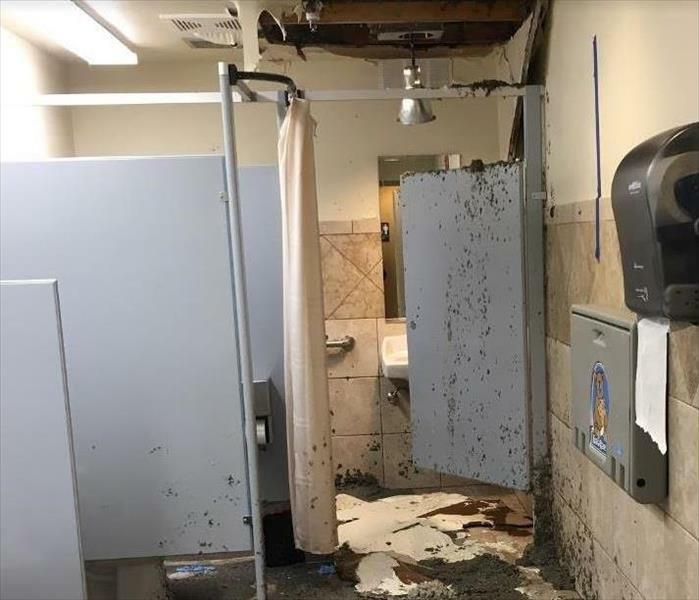 A local church in Aurora, Colorado faced a nasty water loss after a pipe burst above the men's restroom. The water traveled to the front entrance, chapel, nursery & multiple hallways. SERVPRO employees arrived on site ready to clean up the debris and extract the water. After the mess was cleaned up, specialty drying equipment was strategically placed in order to quickly dry the affected areas. 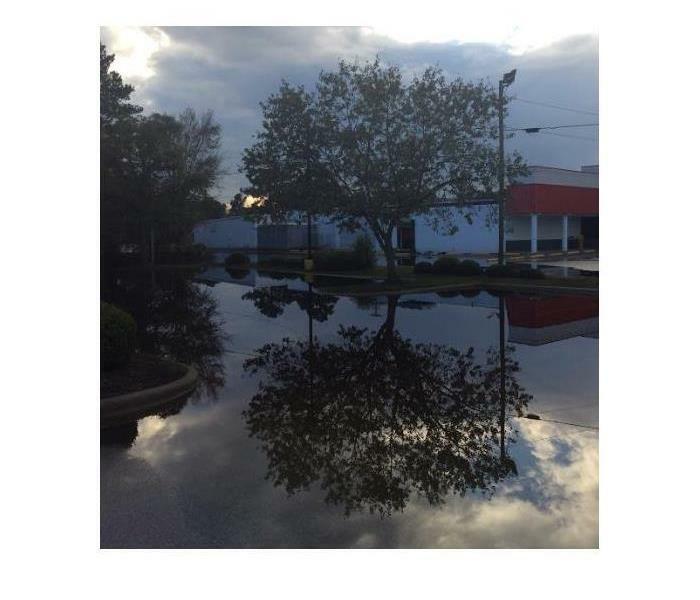 Streets Flooded by Hurricane Florence! 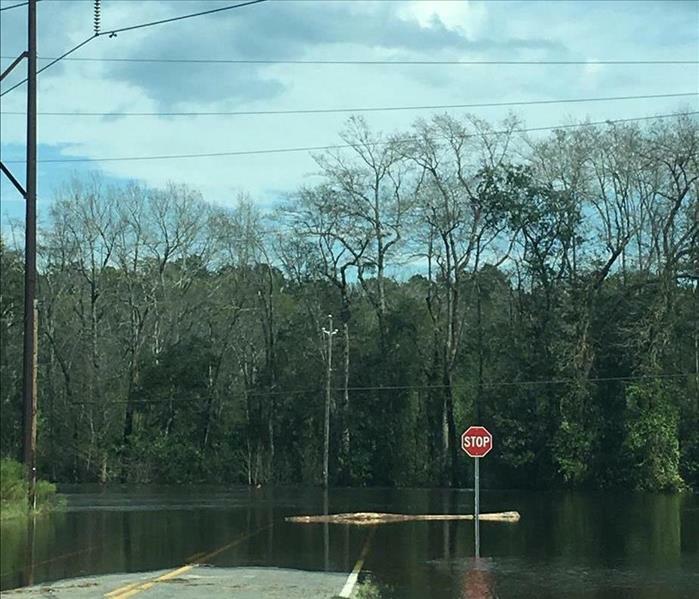 The Disaster Recovery Team of SERVPRO of Aurora traveled to North and South Carolina to provide restoration/mitigation services to home and business owners in need. 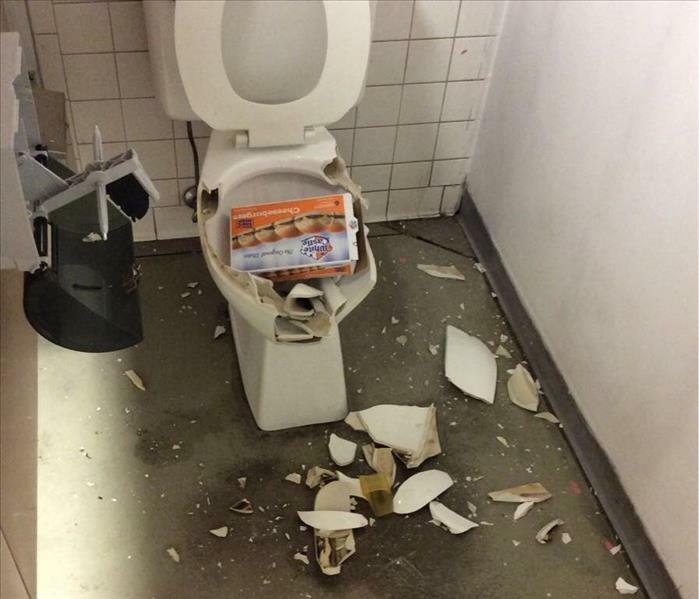 This commercial property faced a water loss after a toilet in the restroom overflowed. 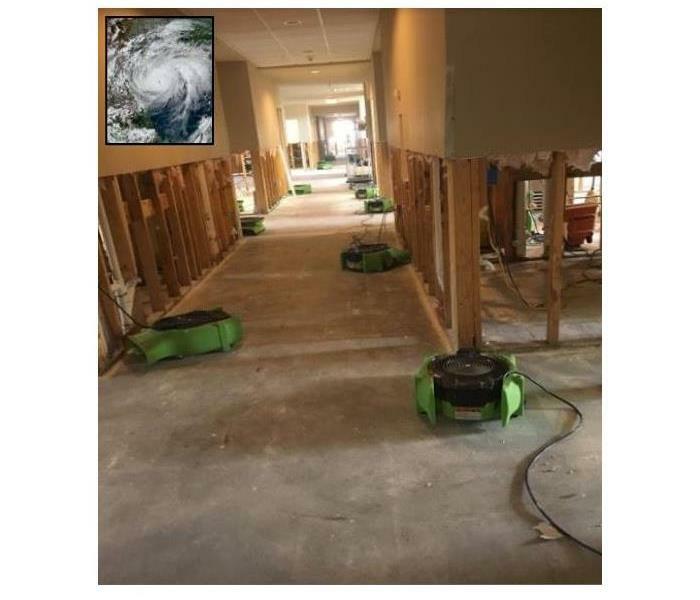 SERVPRO professionals removed the affected material, used specialty equipment to dry out the affected areas and used the appropriate cleaning products for the job. 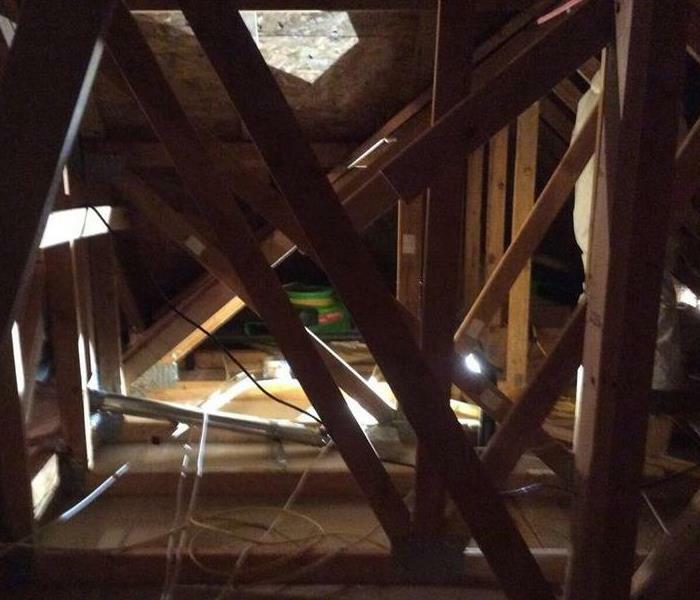 Microbial Growth was discovered in this attic. 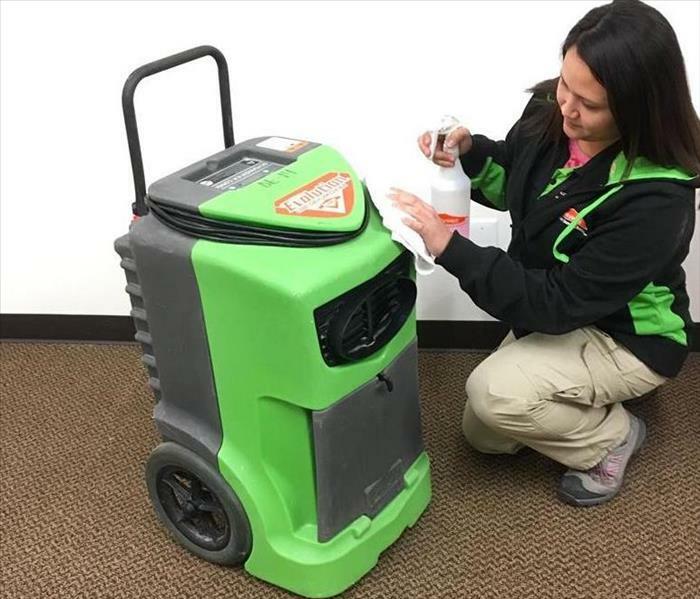 SERVPRO professionals used an anti-microbial solution after containing the affected area and setting specialized equipment. This Fire House under construction suffered from a fire loss. 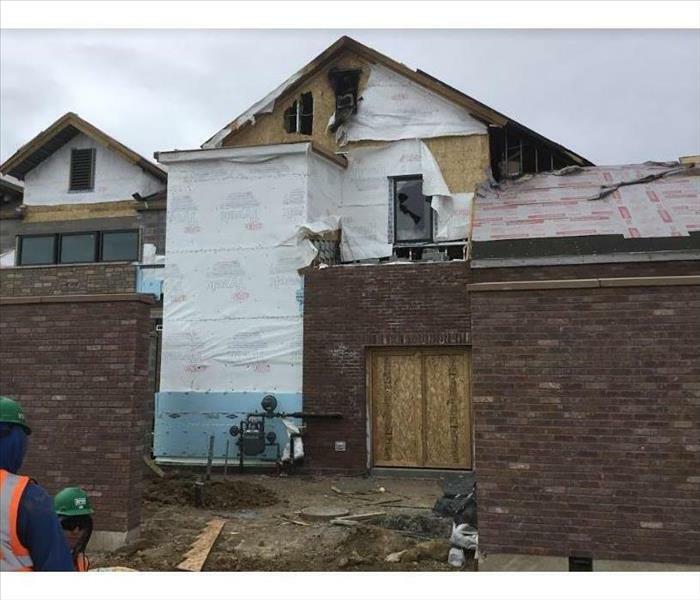 SERVPRO assessed the damage and set fourth a restoration action plan so that construction and rebuilding of the Fire House could continue. A toilet overflowed throughout the night and leaked through to the garage in this Parker, CO home. 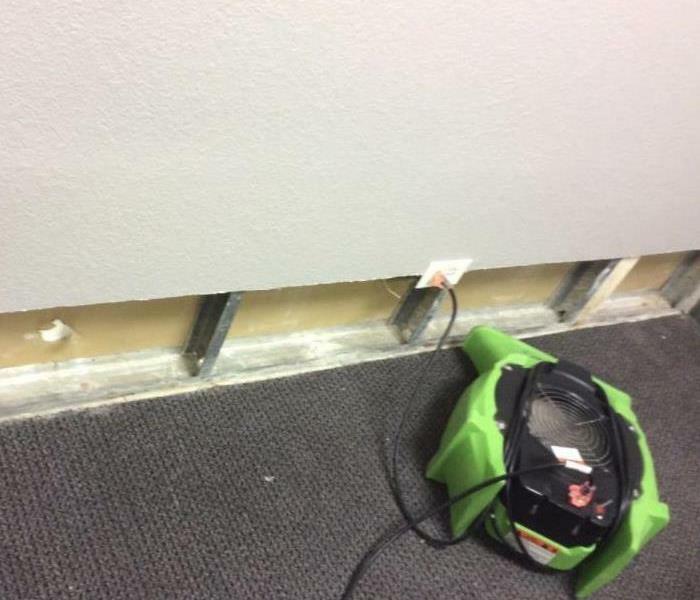 SERVPRO used specialty equipment to dry the affected drywall in the garage. This home in Omaha Nebraska was affected by a winter freeze. 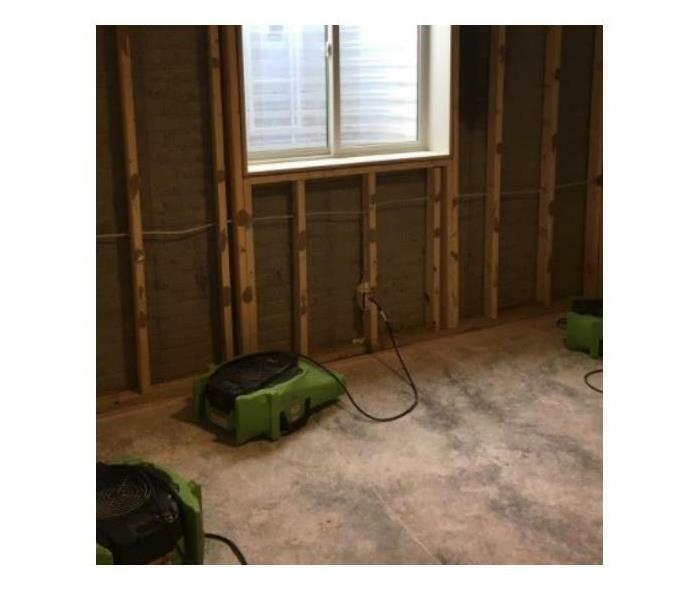 When SERVPRO arrived on site the basement was in need of emergency mitigation. Water burst from a pipe and soaked the basement flooring and parts of the drywall. 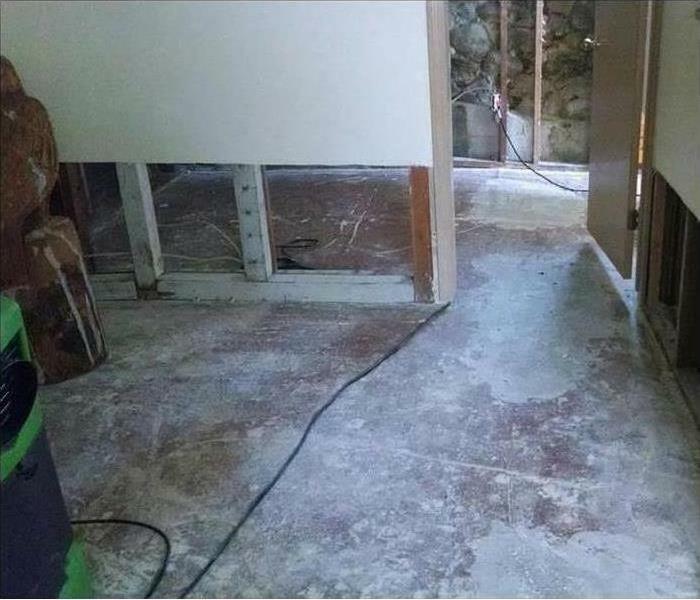 SERVPRO extracted the water and removed affected materials. No this is not an indoor swimming pool, but the result of frozen pipes that burst while the owner was out of town. SERVPRO pumped out the water, dried the structure and restored the home. 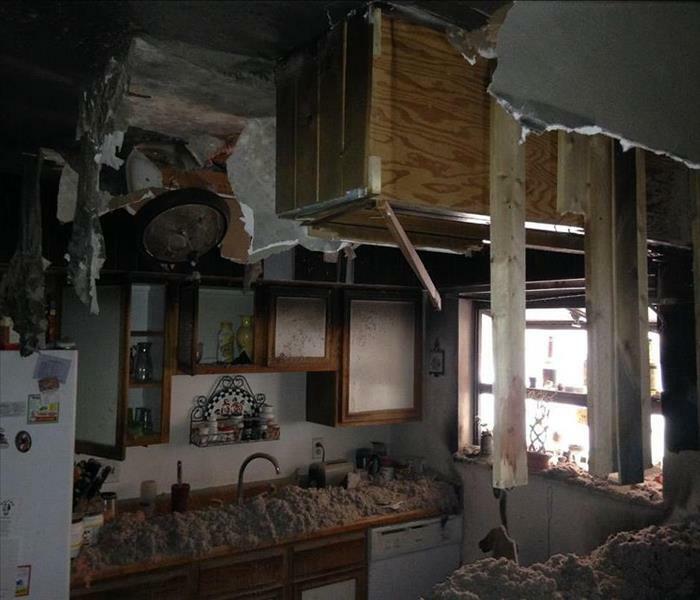 When a fire in the kitchen of a Englewood, CO home caused smoke damage throughout the home our SERVPRO used specialty cleaning products and a little elbow grease to clean and restore the home. 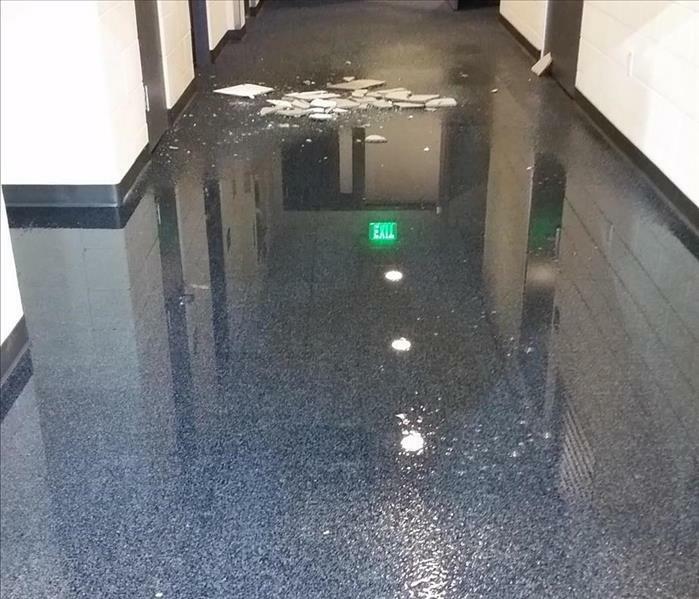 This large company suffered water damage when a pipe broke. We were called in to help dry out the offices and used many pieces of equipment to do so! 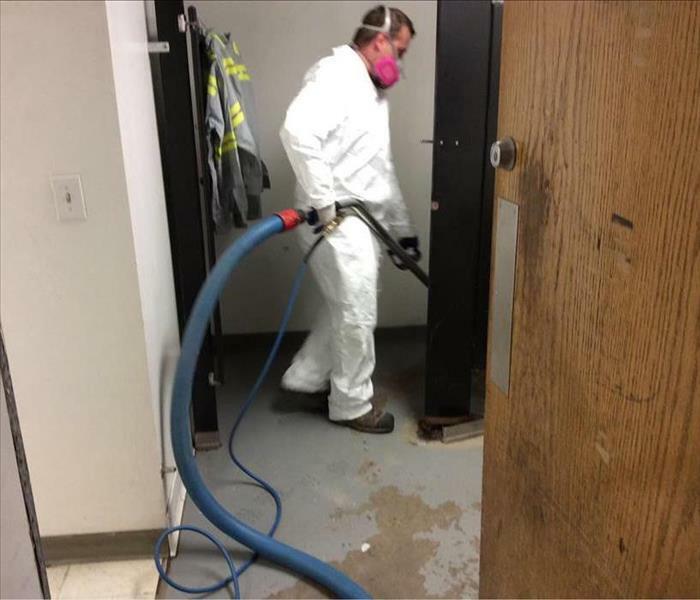 We can restore both big and small buildings, whether it's your flooded basement or your large commercial building. 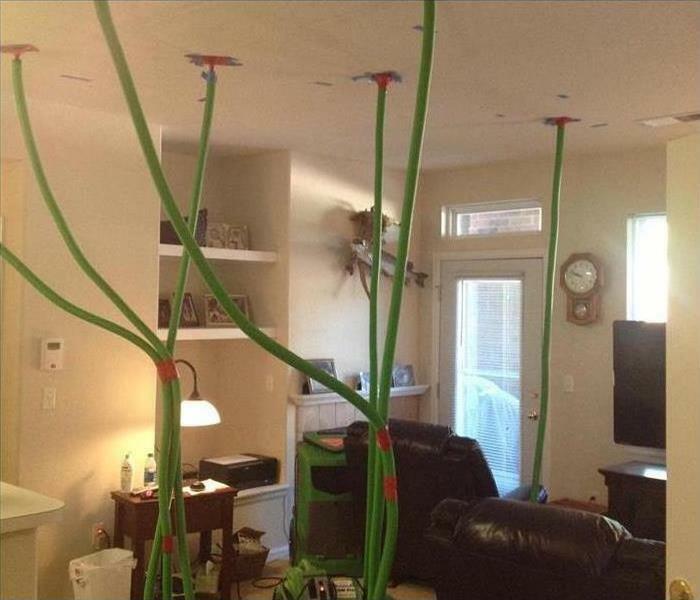 Although it appears to be some sort of green monster, our Injectidry System is being used to dry the wet ceiling of a customer who had a leak coming from above. 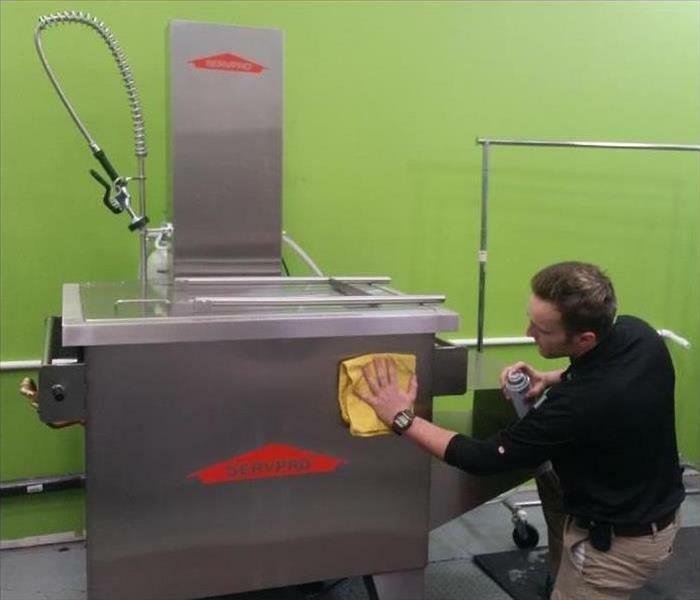 Connor is sprucing up our new ultrasonic cleaninng machine. This machine is used in cleaning of contents and uses ultrasound technology to get your items sparkling clean and looking like new! 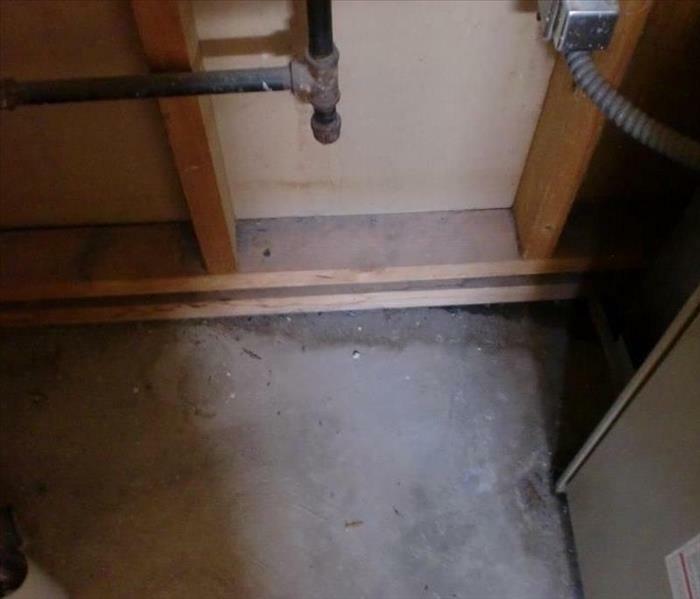 As seen in the photo above, this kitchen hardwood floor was affected by a leak. 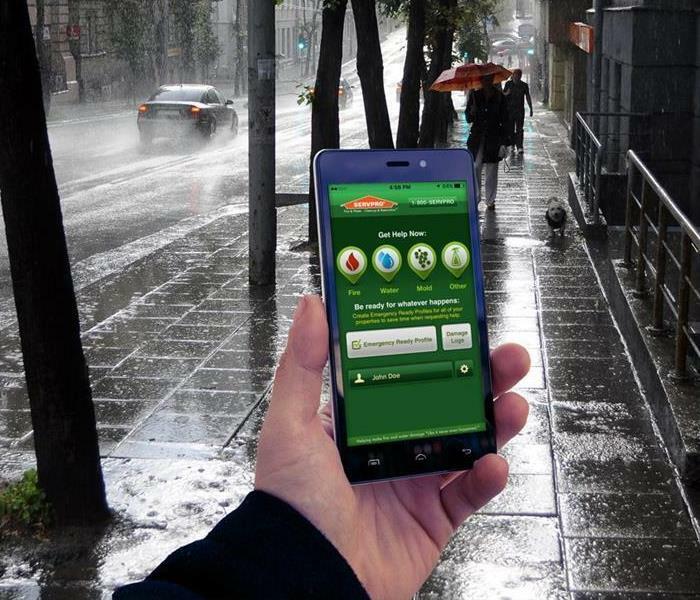 SERVPRO of Aurora Technicians are specialty trained to help treat homes affected by water damage. When your home suffers damage from a fire seeking professional help is a must do. This photo shows a home in Aurora, Colorado that was significantly affected by a fire. Residue from smoke covered the walls. The homeowner called SERVPRO of Aurora who treated the fire damage using specialty equipment and solutions to rid the home of smoke odor. After arriving back from the Tubbs Fire in Northern California. 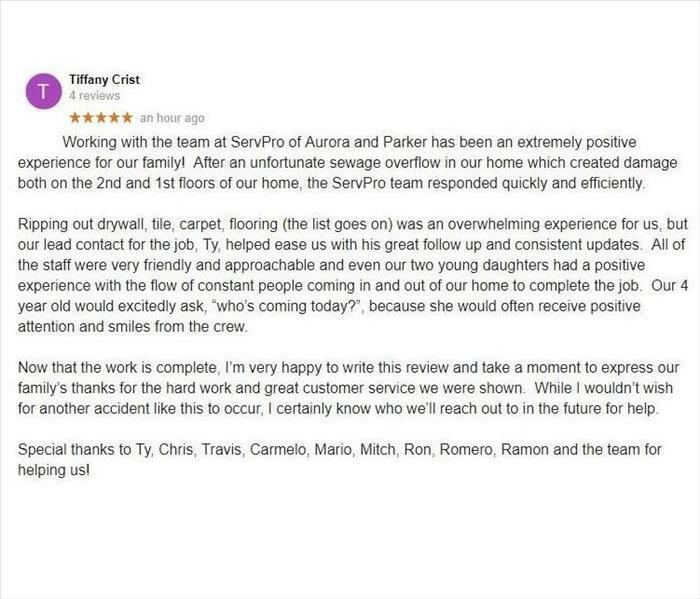 SERVPRO of Aurora received an email from a customer who was very pleased with the service provided. 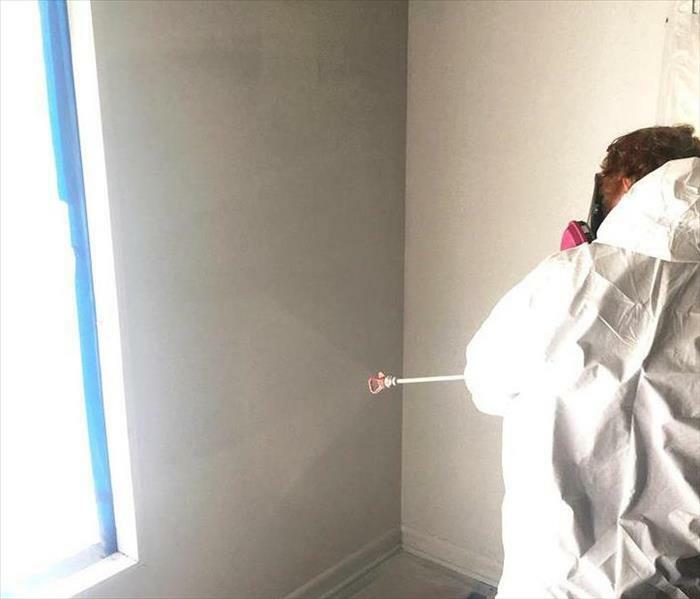 "Your team did an outstanding job of removing the smoke damage from my apartment after the Northern California Fires. I commend Yovan Venegas and his team for their professionalism, expeditious service, thoroughness and kindness in making my home a welcome place to live again. Do know that I will recommend them to all people who need service do to with fire, floods and other catastrophic events that happen to their homes and businesses. They are the best." 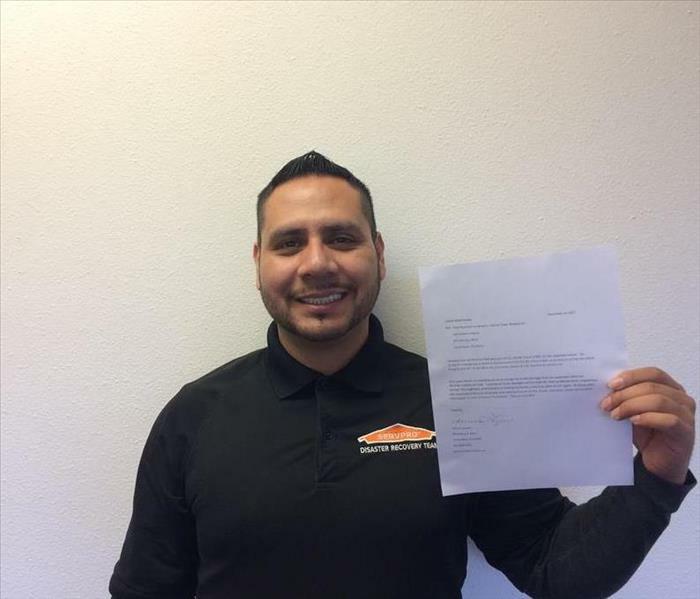 "SERVPRO of Aurora in Northern California?" SERVPRO of Aurora goes where no one else will! We aim to provide a quality of service that is insurmountable. 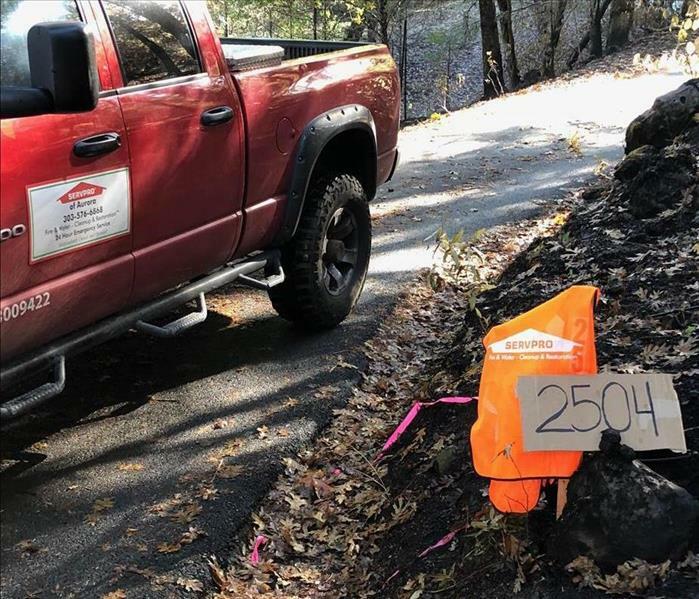 Those affected by The Tubbs Wildfire in Northern California can count on us to restore their soot and smoke damaged homes to what they were before the fire. Do you have a possible Mold infestation? Call SERVPRO of Aurora at 303-576-6868. 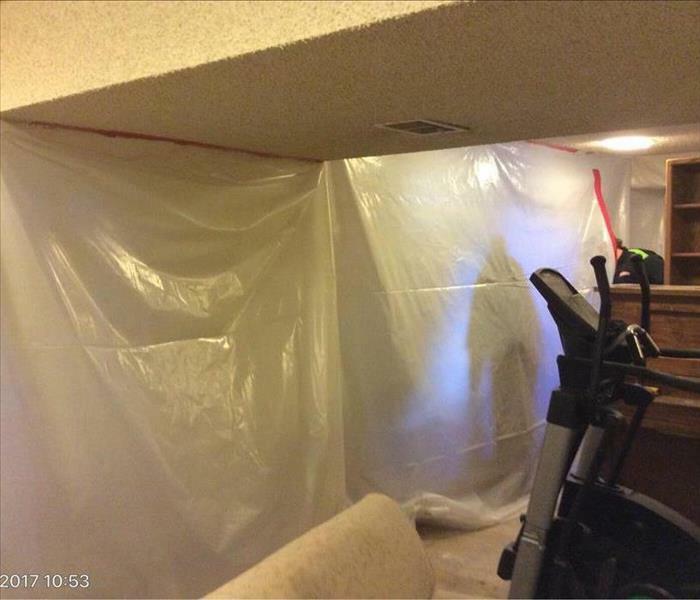 As shown in this photo, SERVPRO of Aurora is working diligently to treat this Colorado home affected by mold. Mold needs to be treated with care and our Technicians have the proper equipment and training to deal with Mold. Don't clean or try to remove mold on your own, as it can spread or possibly be hazardous to your health. 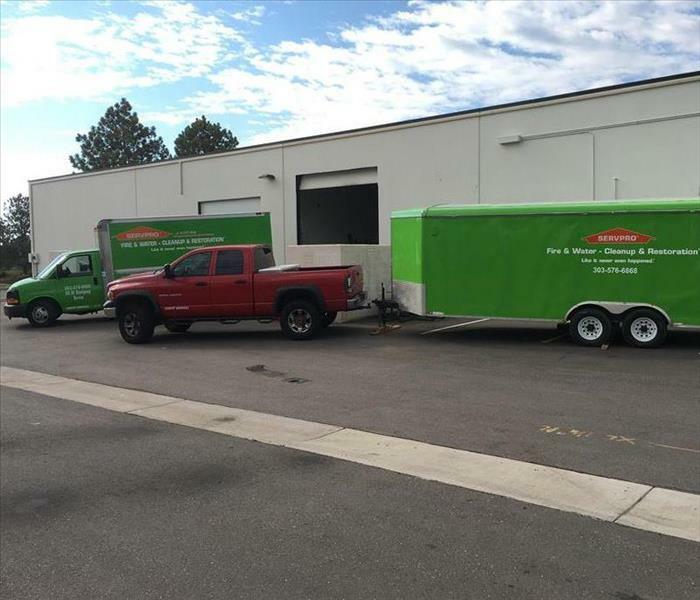 SERVPRO of Aurora arrives at a Colorado home to assess a possible mold infestation. After lifting a portion of carpet, mold was discovered. 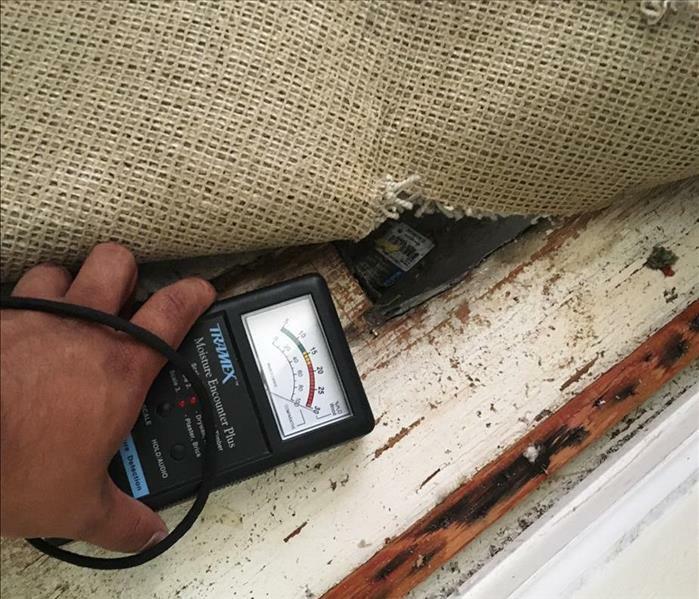 Our Technicians were well equipped and eager to help rid this home of mold growth. Commercial buildings such as schools, hotels, office buildings and recreational buildings need fire and water restoration services too! 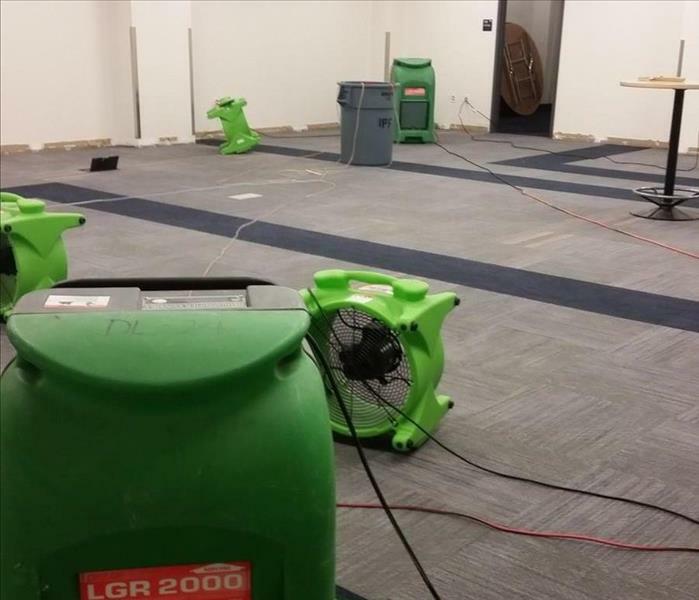 SERVPRO of Aurora provides water restoration service at this commercial building in Centennial, Colorado. As seen in the photo, SERVPRO of Aurora provides water restoration services at this commercial building. "We provide service for residential and commercial buildings!" A leaking pipe can cause significant damage to a home. SERVPRO of Aurora can remove excess water using submersible pumps and industrial wet/dry vacuums. We arrived on the scene of a house fire in Aurora, Colorado. Our Technicians here at SERVPRO of Aurora plan on restoring this home back to pre-fire condition. 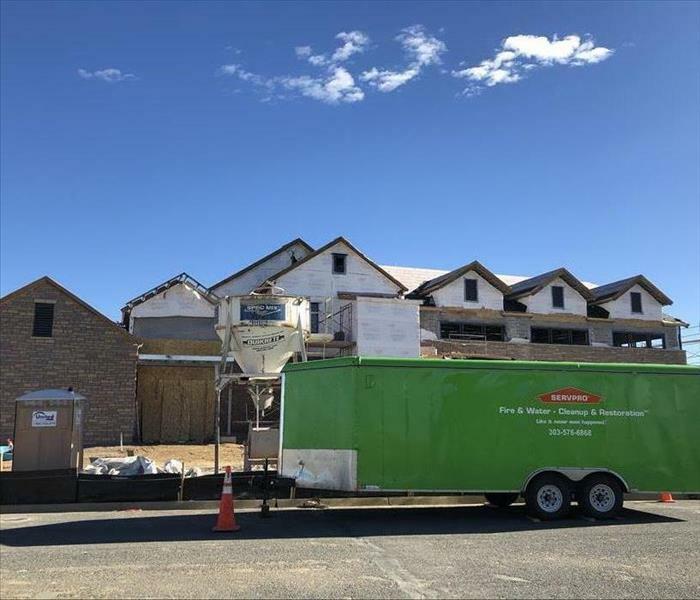 "SERVPRO of Aurora works hard to provide fire restoration services for a severely damaged home." 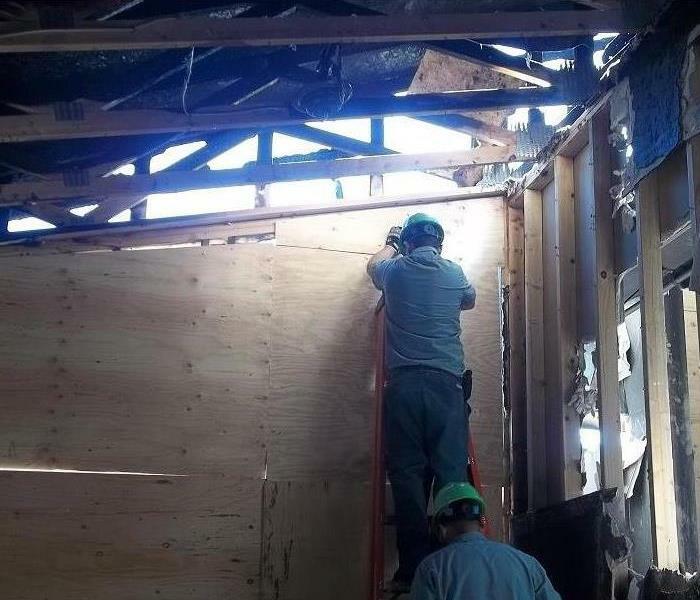 Technicians are seen here, boarding up walls to prevent further damage to the interior of the home. 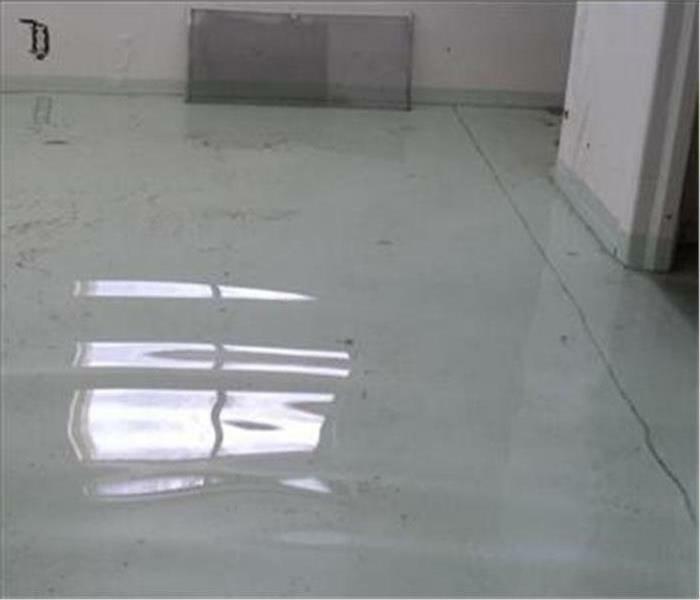 Water Damage can be devastating, especially water damage caused by flooding. SERVPRO of Aurora Technicians used specialized equipment and restoration techniques to clean up and restore this basement to what it once was. 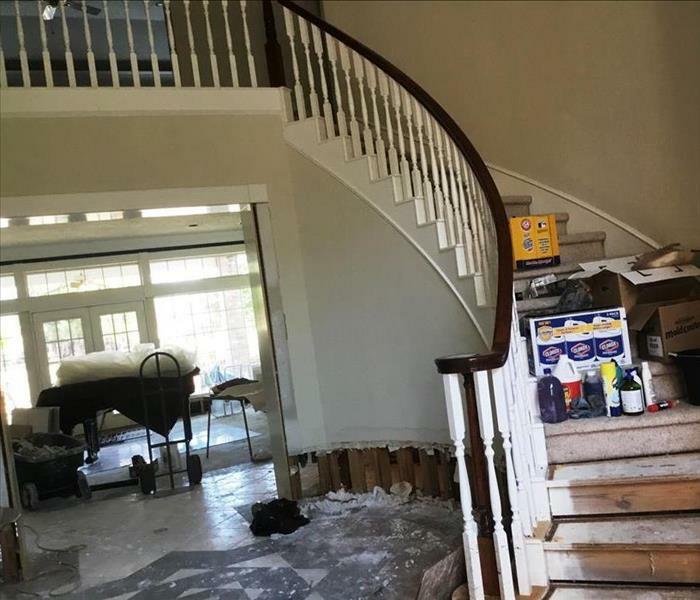 The aftermath of Hurricane Harvey on August 25th 2017, left many homes in need of restoration services. SERVPRO of Aurora traveled to Houston Texas, responding immediately to storm damage emergencies. A fast response lessens the damage, limits further damage, and reduces cost. 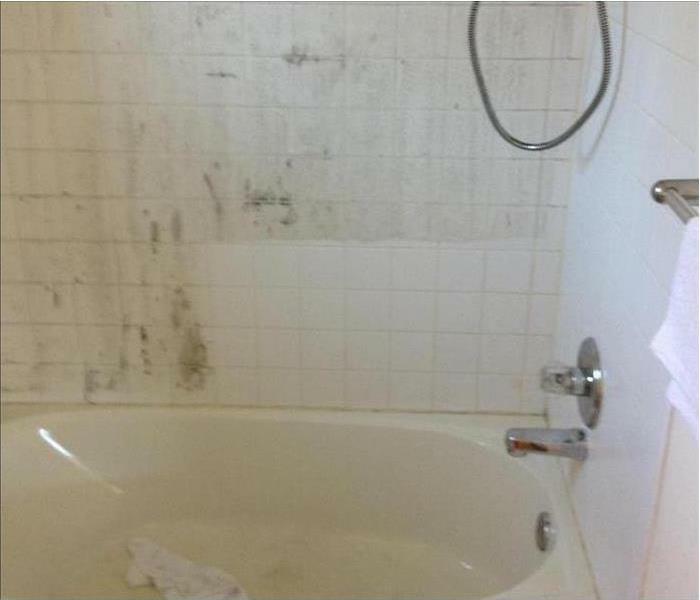 Any floor that remains damp or wet for more than a day may grow mold. 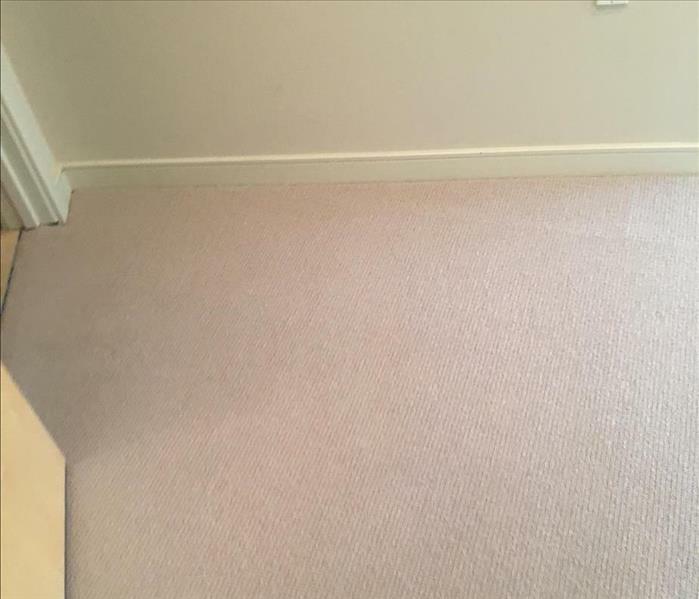 To prevent mold from growing, dry carpet when there's a spill. SERVPRO of Aurora provides restoration services for those affected by Hurricane Harvey. Flood waters reached well above over a foot at this Texas home dock. Using specialized equipment we removed flood debris from this dock. SERVPRO of Aurora got a call from a homeowner concerned that they might have so mold growing in there basement, they had described what it had looked like and they weren't feeling good! They asked us if we could have one of our crew to come look, it was definitely mold! 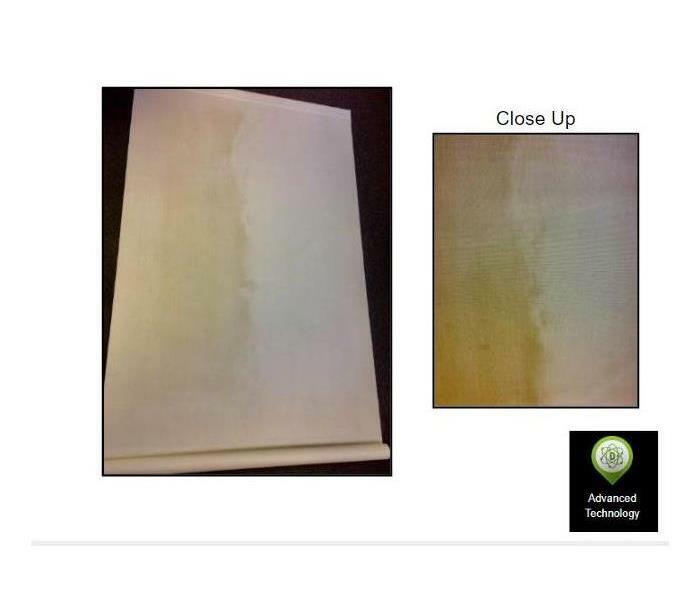 SERVPRO of Aurora got a call from a homeowner concerned about some discoloration in his bathroom cabinet he wasn't sure if it was mold or just dirt! So our crew came to check it out and sure enough it was mold! We set up some containment so the mold couldn't make its way through the house! SERVPRO of Aurora got an emergency call from a restaurant that they were concerned that they had mold on one of there walls so we came out to look. There was some mold so after hours we set up containment and used disinfectant to wipe up the mold! SERVPRO of Aurora got a call from a homeowner concerned that they had mold in there basement. So we came out as quickly as we can to check it out and sure enough it was mold so we set up containment and used our disinfectant to clean the mold up! 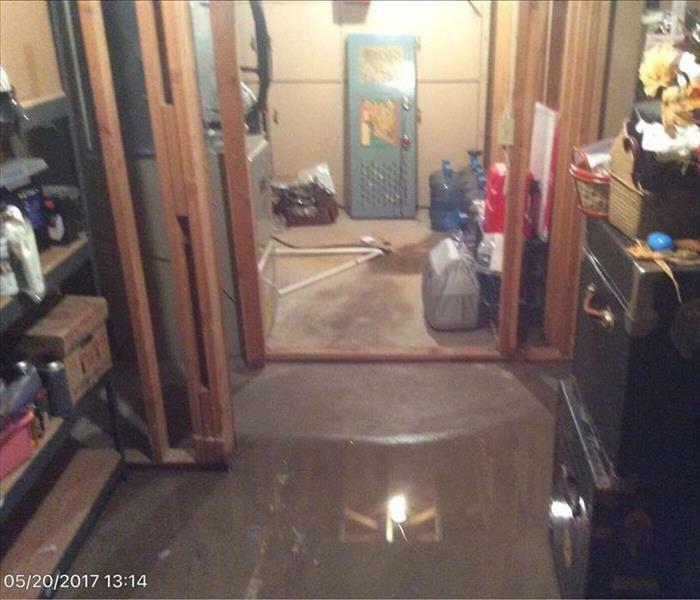 SERVPRO of Aurora got a call late at night because a pipe braking in a basement which had caused a lot of water damage, and a bunch of contents were affected in the water loss! SERVPRO of Aurora got a call from a resident that had heavy rain, which was leaking in through the window seal and caused half of the wall to crack, the Owner was very happy that we made it out to them in a fast amount of time! 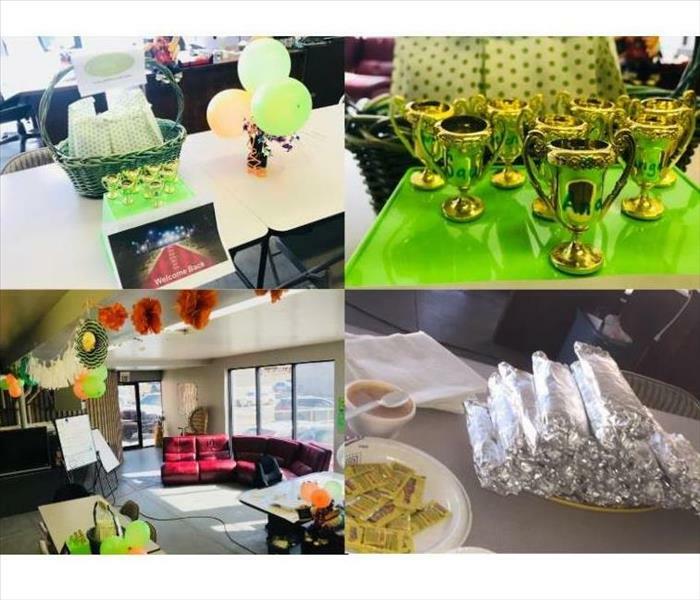 SERVPRO of Aurora got a call from the Storm to come join them to helping out the residents out in Chicago, IL! This is SERVPRO of Auroras first time going to Storm! SERVPRO of Aurora was out on storm when they got a call from a resident saying that the heavy rain storm has caused some water damage to there basement bathroom! 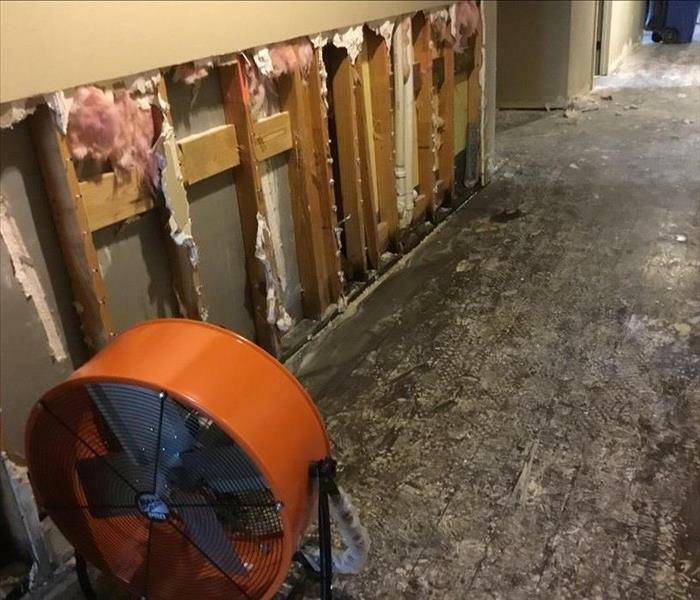 SERVPRO of Aurora had gotten a call when we were out in Chicago, IL when a residents home had water damage due to the heavy rain that flooded the basement! SERVPRO of Aurora got a call from the Storm team for Chicago, IL were they had heavy rains and flooding, here is a photo of a few temps helping out there community! SERVPRO of Aurora got a call for a fire damage! The homeowner was cooking dinner when he all of a sudden felt ill, so he decided to lay down for a bit but had forgotten to shut the stove off. When he had waken up, he woke up to smoke in his house! SERVPRO of Aurora got a call late at night for a fire that had happen! A garage caught on fire, there was a significant amount of soot and smoke damage, only a few things were savable! 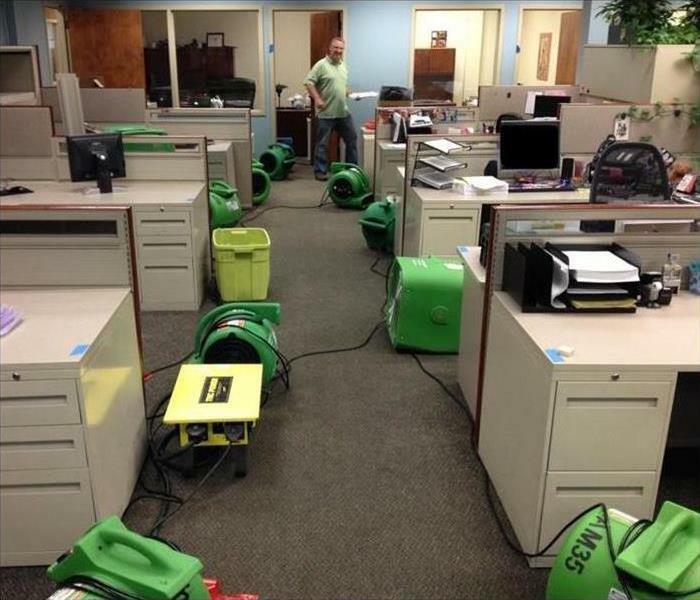 SERVPRO of Aurora got a call from a commercial building due to some heavy rain! This is what had happened after the heavy rain was done, the ceiling caved in! SERVPRO of Aurora got a call from an apartment complex due to some water damage. The third floor unit had some water leaking which made it's way down to the second floor unit's bathroom! 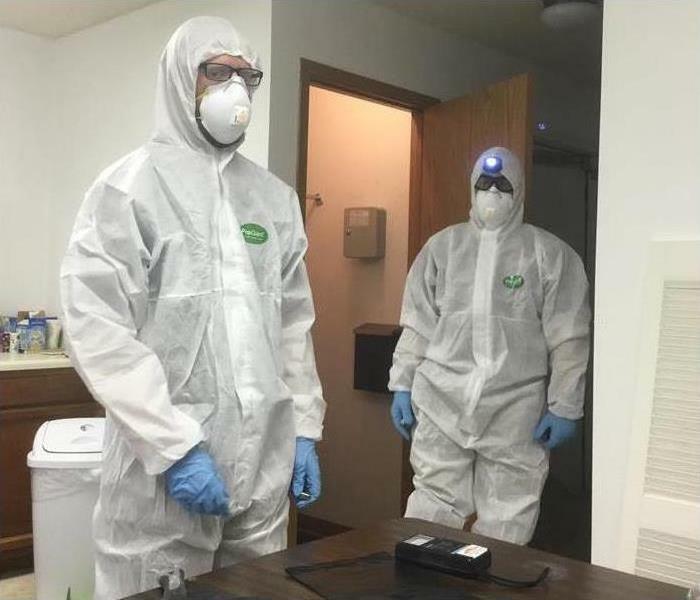 SERVPRO of Aurora got a call from a commercial building for some sewage back up, so we geared up as fast as we can and came to clean up the nasty smelly water! Spring is full of surprises, but don’t let disaster be one of them. Be "Ready for whatever happens" by creating an Emergency READY Profile® for your home or business. We set it up for you and it's free. That's right, FREE! Contact us today for your free ERP. 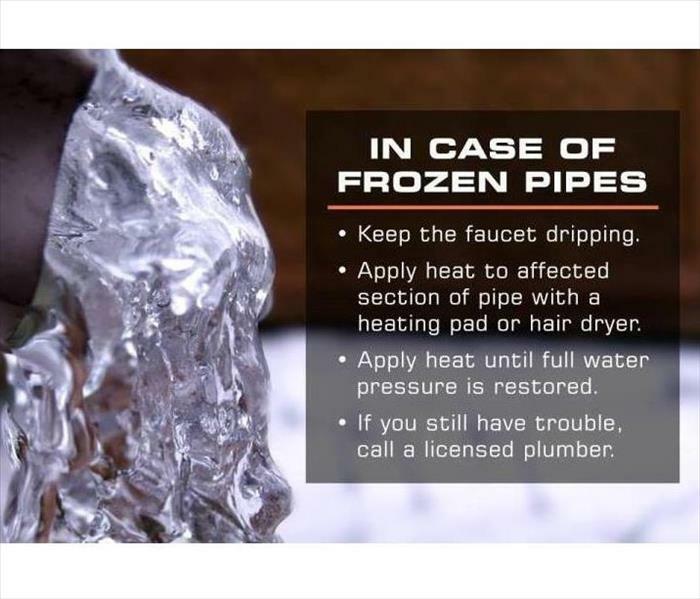 Frozen pipes can be a real nightmare for anyone effected by them. If this happens to you in this negative degree weather, here are a couple of tricks from SERVPRO of Aurora in hopes of saving you from a major headache. 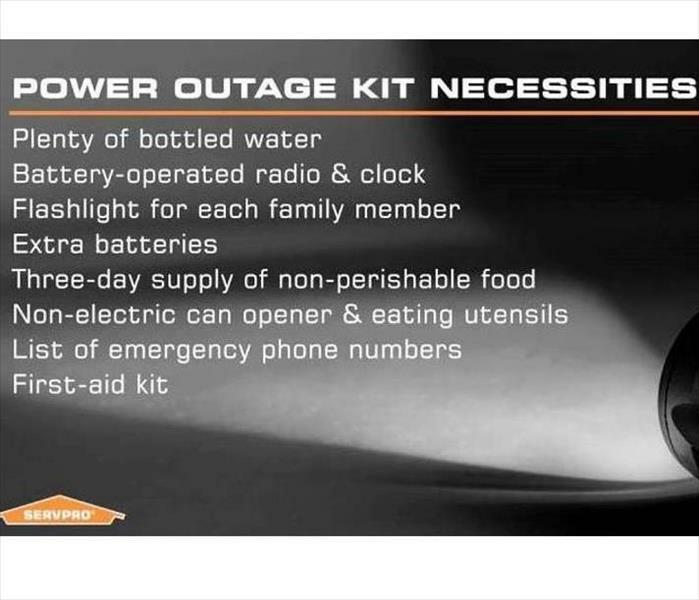 In times of extreme weather or in the case of a power outage, make sure your'e always prepared. Here are a few tips from SERVPRO of Aurora to keep you and your family safe. 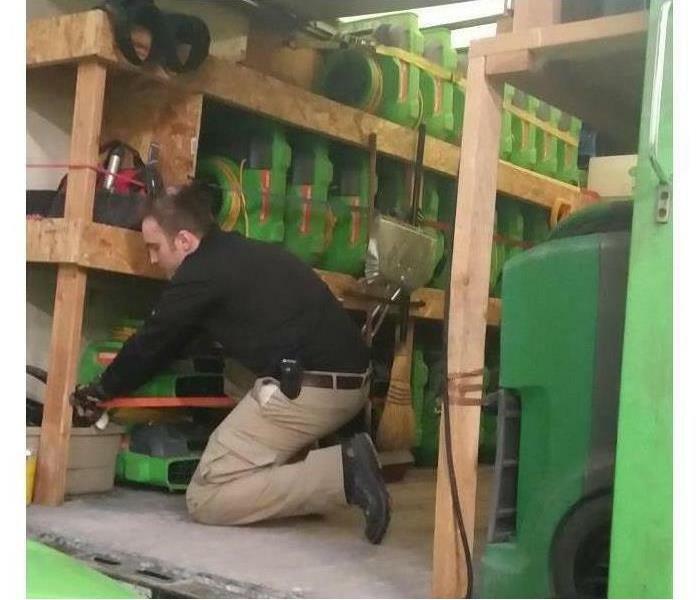 Here at SERVPRO of Aurora, we know how important it is to keep our equipment clean and properly running. 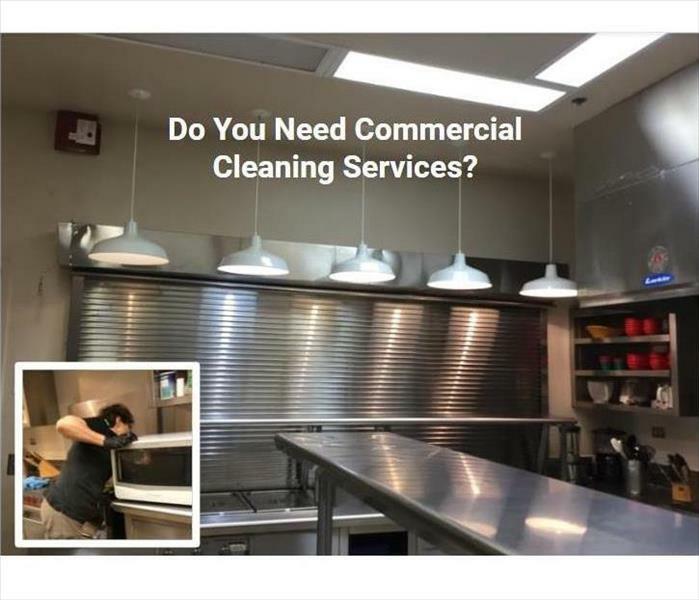 Without regularly cleaning and maintaining equipment, there is always a chance that it could cross contaminate an unaffected area or break down and fail to preform the job it is intended for. 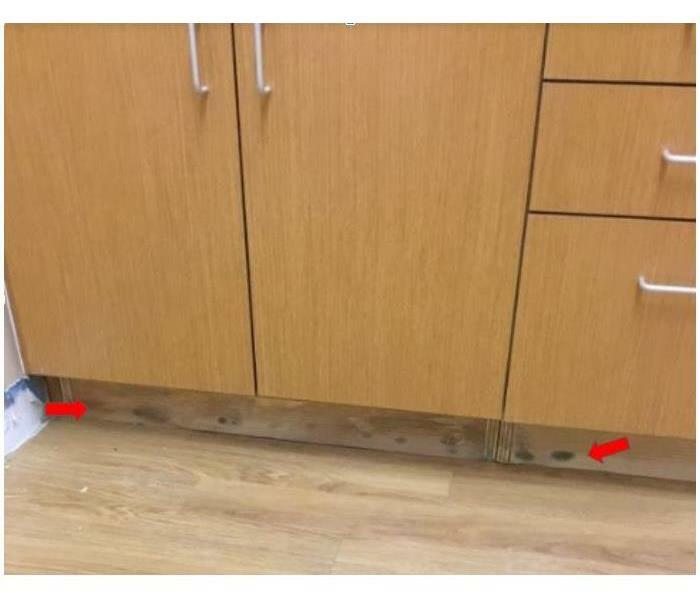 That is why SERVPRO of Aurora is very diligent in maintaining and disinfecting all of our equipment and continuing to make it "Like it never even happened." This is just a small example of how are amazing carpet cleaners can make your carpet look. SERVPRO has special patented carpet cleaning chemicals that can beat anything our competitors are using. Have something bigger than a house that needs cleaning? 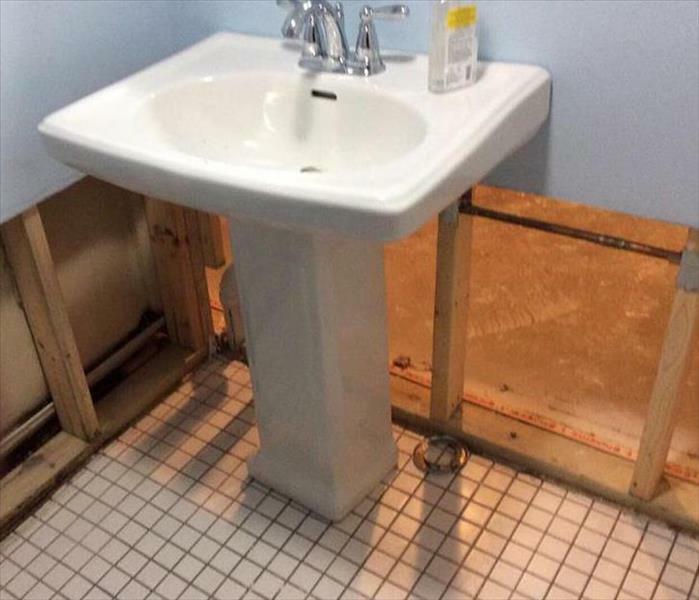 No problem, we take care of everything from a single room to an entire commercial building. Nothing is to big or small for SERVPRO of Aurora. Once we bring salvageable fire damaged content back to our location, this is the room it starts off in. 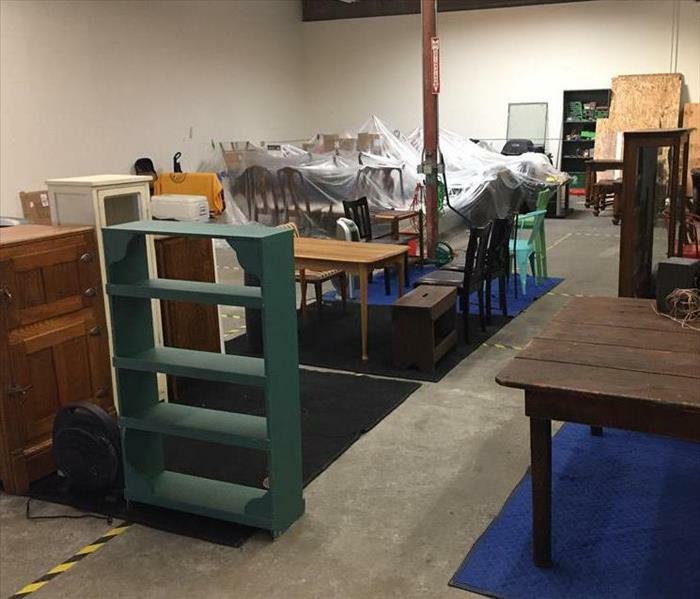 Our fire experts then proceed to do their magic and restore your fire damaged goods back to previous condition. When SERVPRO of Aurora is taking care of your contents, you know they're in good hands. This is just one of the content rooms here at SERVPRO of Aurora. We have separate rooms depending on what the content is in need of. 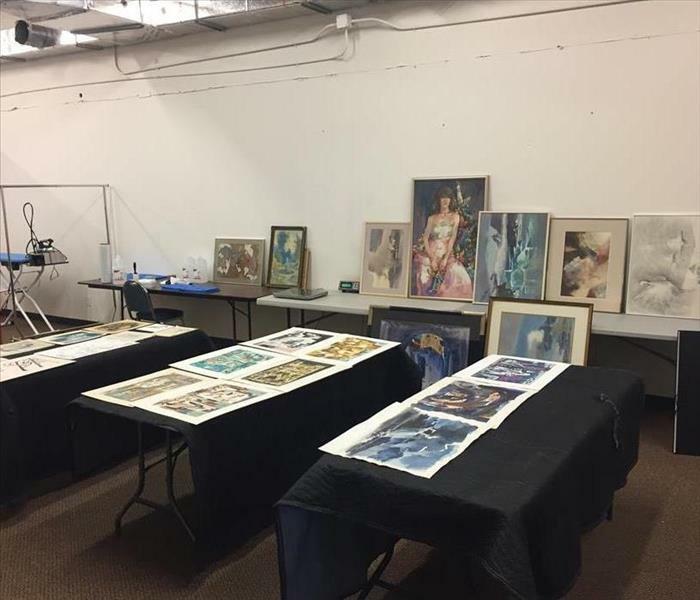 It ranges all the way from water damaged, mold, fire damage, all the way down to storage of the content once it is restored. 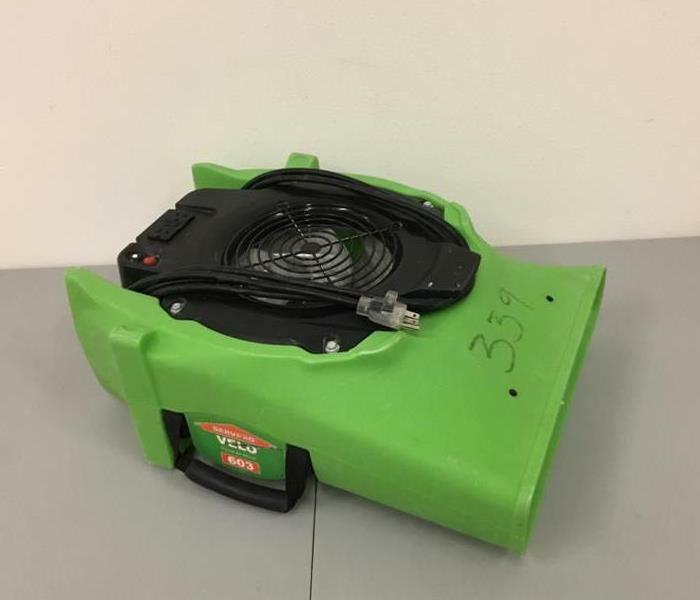 SERVPRO of Aurora has some of the Velo model air movers. These are much more efficient than the snail model fans. They also use a lot less amps allowing them to be daisy chained, and produce less noise, making them less intrusive in your home. This was the aftermath of a kitchen fire in Aurora when we arrived on the scene. There was significant smoke and soot damage. The owner couldn't believe how quickly and completely we were able to clean the soot from the walls and ceiling. We make disasters "Like it never even happened."